This almost seems too obvious. 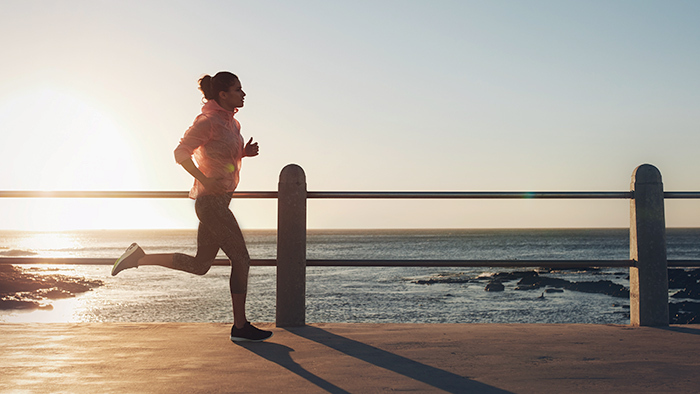 Add a few miles to your daily and weekly running, and improvement will follow. All of my training programs embrace this philosophy, gradually adding miles as runners progress from week to week to a half or full marathon finish. Just don’t add the miles too quickly. Gradually increasing miles works best. This seems to contradict the first secret, but even while adding miles, you can still run some of those miles faster. Every workout should not be done at the same pace. On at least one day a week run at race pace, which will help you to nail that pace in competition. Say “speedwork” and it scares many new runners. They fear the pain that supposedly accompanies grinding sessions on a track. Note my use of the word “supposedly,” because sometimes training hard can hurt. But speedwork need not be difficult. Put in most of your miles at an easy pace, which allows you at appropriate times to focus your attention on speedwork. This way you will improve without blasting every workout. Adding or substituting other sports can help you maintain, if not improve, your aerobic fitness. In my programs, when I tell runners to cross train, I mean doing some alternate activity—and doing it easily. Swimming, cycling and walking work well. Cross-country skiing is the perfect exercise if you have snow. Strength equals speed. Particularly with the finish line in sight— with all systems used to propel you forward about to break down—runners need strength to provide that final burst. I usually show up at the gym two or three days a week, often after a run, and spend 15-20 minutes moving from machine to machine. Total fitness helps with everything you do. Scientists have a hard time proving that stretching can either prevent injuries or provide a means of rapid recovery, nevertheless most runners believe both to be true. For best results warm the muscles gently before your run. Even a half mile of slow jogging is enough to get you going. Stop. Stretch. Continue running. Easier said than done, but injuries can be minimized, if not entirely avoided, by simply following all of these 12 tips. See a podiatrist before you get hurt. Investing in a gait analysis before visiting the running shoe store might offer you some protection against buying a shoe that exacerbates an existing problem. Many injuries can be traced back to worn-out shoes or the wrong shoe for your foot type. Let me confess a certain bias when I offer this advice, since I provide training programs both on my website and interactively through TrainingPeaks. Nevertheless, intelligent training rules every time. Learning how to balance your elements remains the key to success. I now train mostly on my own for convenience, nevertheless for most of my career I partnered with runners near my ability for tough workouts on the track or for long runs on the roads and in the woods. When you train with others, it allows you to follow their pace and sometimes coax them to follow yours. The best way to find partners, as above, is by joining a club. The Road Runners Club of America contains 1,100 member clubs with 250,000 individual members. They range in size from the Anniston (Alabama) Runners Club with 350 members to the New York Road Runners with 40,000 members. Camaraderie can help motivate you to higher accomplishments. Yes, coaches cost money, but it could be money well spent if it allows you to improve as a runner. TrainingPeaks offers dozens of coaches who can work with you online. Many of the clubs mentioned above also provide coaching. But be sure to hire a coach with good experience who can practice the art as well as science of coaching. Experienced coaches have learned how to dig deeply into a runner’s background and current situation in order to develop a completely individualized training plan with workouts based on your history, current level of fitness, general ability and both short- and long-term goals. This might be the most important secret of all. Train at a comfortable level for a long time and tweak your training program from time to time, and you can continue to run fast. You have to put the time in. You have to show up. Repetition is the mother of all skills. In next week’s installment, Higdon will give you expert tips for how to navigate your mind and body on race day.